France in London | The UK crowned King of Health and Safety, even when it comes to the "galette des rois"! 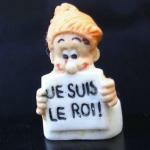 The UK crowned King of Health and Safety, even when it comes to the "galette des rois"! On the second Sunday after Christmas, in thousands of French homes, the youngest of the family crawled down the table and blindly distributed to all the members of his family the slices of a puff pastry cake filled most commonly with almond paste (frangipane) known as a galette des rois. Once everyone is served, it is a race to find, in the frangipane stuffing, a tiny figure called “fève” in French. The owner of this sought-after porcelain statuette then earns the right to be king or queen for the day, wears a golden cardboard crown, and most of all, each time he or she drinks, the others shout « The king drinks, the king drinks! ». Whose fault is it? Impatience maybe? How could they know it could be so big? How would they know it’s as hard as a rock? Suppose a lambda English lover of French gastronomy sees through a patisserie window the famous galette des rois, buys it, and discovers the existence of the “fève” when biting into a piece of galette to take a mouthful. Should the baker be blamed for destroying his smile? The English, who are always very aware of “Health and Safety” issues are keen to avoid any potential law suit and they have found the perfect solution: bakers now supply the fève separately from the galette. The customer then has to insert the fève inside the galette before it is sliced. If it ruins the surprise for at least one person (someone has to know where the fève is! ), at least no one will blame the baker for these hazardous turnouts. If the cream becomes too thick, add a little Crème fraîche. Spread the cream on the first disk, place the charm. Cover with the second disk and seal the edges. Spread a mixture of egg yolk and water on the top with a brush, being very careful with NOT spreading any of it on the edges. Make some little cuts on the edges to allow the pastry to rise, and make few holes on the top of the disk to allow the steam to get out. Pre-heat the oven at 230 C.
Cook in warm oven for 35 to 40 minutes (you can start with the oven at 220/230 C for 15 mn then with oven at 200 C for 20mn. Add icing sugar 5mn before the end of cooking time or with little syrup. Let the galette to cool down a little before serving.